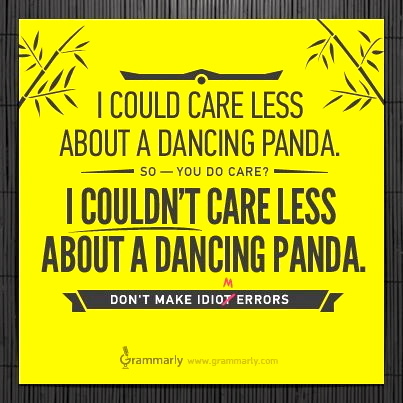 Grammarly is peeving obtusely here, affecting to misunderstand an idiom — could care less — that’s been around for at least 60 years and is now a commonplace. No modern speaker should fail to understand the intended meaning of the idiom. Back in 2005, Mark Liberman posted an inventory of Language Log postings on could care less (up to that point), including the important “Negation by Association” posting explaining John Lawler’s account of how the idiom developed, using the parallel of French ne (negator) > ne pas (strengthened negation) > pas (negator), in which what was originally a concomitant of negation becomes the mark of negation. For could care less, the development is from couldn’t care less (a semantically transparent construction that became a formula for expressing strengthened negation), with n’t as the mark of negation, to could care less, in which less is now the mark of negation. But whether you appreciate this account of the history, you should appreciate what people are doing with the idiom and not just insist that millions of people are getting the expression wrong. This entry was posted on August 6, 2012 at 9:59 am and is filed under Idioms, Negation, Peeving. You can follow any responses to this entry through the RSS 2.0 feed. You can leave a response, or trackback from your own site. My take on “I could care less” is somewhat different from John Lawler’s in that I don’t see it originating from “I couldn’t care less”; rather, I suspect that it is a transfer from sarcastic usage, where “opposite talk” is usual (e.g. ‘Oh, you look lovely today’, said sarcastically to someone who looks like hell). The typical intonation and voice quality with “I could care less” seem sarcastic to me. That’s the primary competing hypothesis, espoused especially by Steve Pinker. See the Language Log discussion. I find it strange that peevers worry so much about syntax that they completely ignore pragmatics. Why the hatred of metaphor and noncompositional meaning? Maybe they ignore pragmatics because it doesn’t occur to them to consider it, or because to allow for it would remove their raison de peever. “Illogical” idioms present an easy target for generalised or sublimated irritation. Peevers always say “two negatives make a positive, so ‘I’m not saying nothing’ means you are saying something, ahahaha” – but try asking them if they therefore approve of “I don’t never say nothing”. Which is to say that regardless of their claims, logic has nothing to do with it. Even less so pragmatics – or their lives would be one giant hell of misunderstandings.